More news just in from Chany Sabates and Frank Grzeszczak at International Yacht Collection as their co-central agency for sale, Trinity's 49.9m motoryacht Mine Games relocates to the Miami Beach Marina until after the football Super Bowl on February 7th 2010. 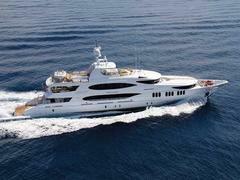 Built in 2007, this superyacht has a classic Patrick Knowles interior, is helicopter capable and is fitted with zero speed stabilisers. But perhaps her most unusual sales point is the Triton two-person submarine that's included in the price of $31.45 million.